Available for free since 1994 Tent Show Radio is a weekly one-hour variety series showcasing regional and national acts including the Blue Canvas Orchestra performing at Lake Superior Big Top Chautauqua , Bayfield Wisconsin. Tent Show Radio is hosted by best selling author, humorist and singer-songwriter, Michael Perry. In 2018, Lake Superior Big Top Chautauqua will celebrate its 33th season under the big blue canvas tent on the south shore of Lake Superior near Bayfield, Wisconsin. 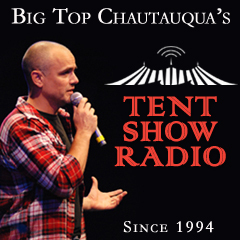 Available for free and hosted by best-selling author Michael Perry, Tent Show Radio is a weekly one-hour variety series showcasing live performances from Lake Superior Big Top Chautauqua, Bayfield Wisconsin.